Over its time there were many building improvements and extensions to the hotel. In 1888, Gordon and Gordon architects drew up plans to add a billiard room, a dining room and 18 other rooms. Included in the plans was the latest patent elevator, later known as a dumb waiter, which transported food from the from the kitchen to dining room thus saving time and labour. In 1907 S. Carkeek assumed possession for a second time and informed patrons that the hotel had been thoroughly renovated and added to. During the depression of the early 1930s, men on the dole carried out work for the Wodonga Shire Council. One of the projects during the term of councillor Mick Martin, as shire president, was to seal the footpaths in central Wodonga. Local business people supplied the cement. The police department refused to fund the cement for its section of High Street, north of the railway line, which included the police station and the courthouse. The then licensee of the Terminus Hotel offered to provide the cement for sealing the footpath in front of the police station and courthouse. This offer was made on the condition that tiles bearing the words Terminus Hotel be inserted into the footpath pointing toward the hotel. The police objected but the hotel licensee, Tex Bailey, won the day. As a result, his hotel’s tiled name was inserted into the footpath in front of the police station. 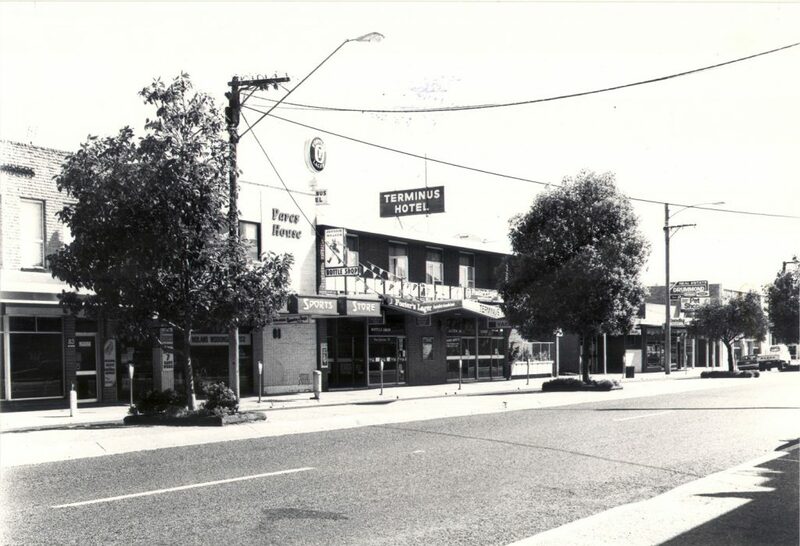 Cr Mick Martin’s son, Des, wrote to the council in 1967 asking that the sign be preserved and it was moved to the Terminus Hotel and placed in the footpath there. In 1998 when the Terminus Hotel was destroyed by fire the Wodonga Historical Society asked the local police and the city council to ensure the sign was not damaged by heavy equipment entering the building to clear away the debris. Today the mosaic remains part of Wodonga’s history, marking the site of the Terminus Hotel. The site now holds the Tristar Medical Centre. The Wodonga Historical Society meets on the first Tuesday of each month at 2pm in the Wodonga football club rooms, Vermont Street. Visitors and new members are welcome. To view the society’s collection please visit its display rooms at 19 South Street, Wodonga, open on the first Sunday of each month from 1pm to 4pm. Don’t forget to like Wodonga Historical Society on Facebook.